The third installment in the US Mint's D.C. and U.S. Territories Quarters Program is the Guam Quarter available May 26, 2009. Guam's original inhabitants, the Chamorros, are believed to have arrived from Indonesia around 4,000 years ago. Extremely capable seafaring people, they built boats called flying proas, still hailed as technological marvels today. The Chamorros lived in relative isolation for thousands of years until the early 1500's, when explorer Ferdinand Magellan arrived. Contact was still at a minimum until the Mid 1600's, when Spain colonized the island and used it as a trade center. Spain retained control of Guam until they lost it to the United States during the Spanish-American War in 1898. The US also used the island to facilitate trade in the area. In World War II, Armed forces from Japan invaded and took possession of Guam for two and a half years until their defeat, when the United States regained control. Today, tourism is the main source of income on the island, mainly from Japan. The presence of the United States military also significantly affects the economy. The other quarters available in 2009 as part of this series are the District of Columbia quarter , the Commonwealth of Puerto Rico quarter , the American Samoa quarter, the U.S. Virgin Islands quarter and the Northern Mariana Islands quarter. All will be minted in quantities to meet demand. 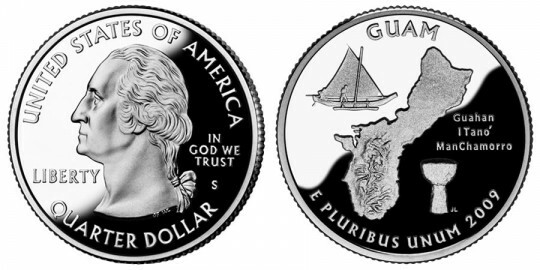 Jim Licaretz designed the reverse which incorporates an outline of the island of Guam. The custom built boat known as a flying proa is showcased along with a latte stone (an architectural structure built all over the island for millennia). The inscription Guahan I Tanó ManChamorro, meaning Guam - Land of the Chamorro, is also present.